Approximately two years ago, in response to an increasing demand for additional modern home floor plan concepts from our clientele, the Riverbend design team put itself to work on a new collection, The Moderns™. This distinctive timber frame home style, exclusive to Riverbend Timber Framing, blends our tradition of high-quality timber craftsmanship with the forward-thinking designs of modern architecture. We hope you’ll agree that the blending of authentic timber artisanship with modern style homes, makes each element more stunning. The Newport Modern Home Concept from The Moderns™ Series by Riverbend. In part one of The Moderns™ series, we wrote about the mid-century architectural giants and the stunning homes they designed that offered inspiration to our team. We shared some of the distinguishing features of these homes as well as where they tend to work best in terms of property type and site orientation. This second article in our series seeks to provide you with specific insight into two of the conceptual designs from The Moderns™ collection. Do you need to read part one? You’ll find it here. Designed to emulate the styles of mid-century modern architectural masters and inspired by residences such as Mies van der Rohe’s Farnsworth House, each home in The Moderns™ collection features a simplicity of design, combined with authentic, visible, timbers and post-and-beam elements. 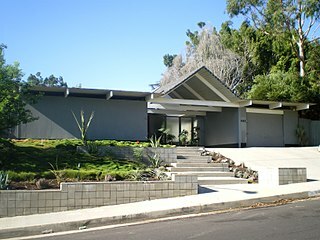 The bold use of glass connects each home’s interior with its natural surroundings in much the same manner as the one seen below, by Joseph Eichler. Please keep reading to discover the Wright and the Newport. 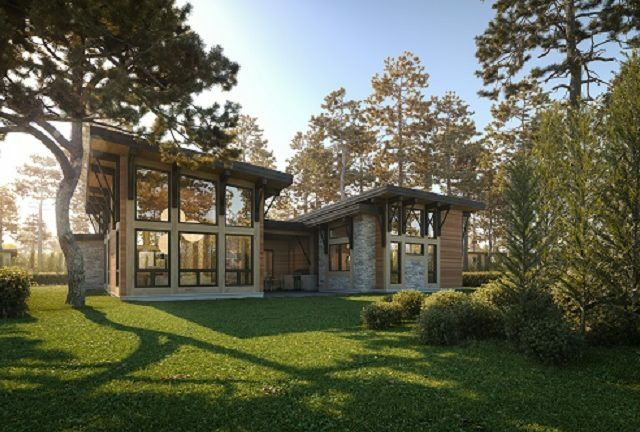 Named after none other than Frank Lloyd Wright himself, the Wright is a single-level home perfectly designed for today’s living. Whether you are hosting family gatherings, client dinners, or a neighborhood cook-out, the Wright’s large, open living areas flow seamlessly to its welcoming outdoor spaces. With its own fireplace and kitchen area, the Wright’s outdoor features are as refreshing as its indoor ones. Reminiscent of its namesake’s ground-breaking work nearly 80 years prior, the Wright’s generous use of windows offer a charming glimpse of its interior timber framing. 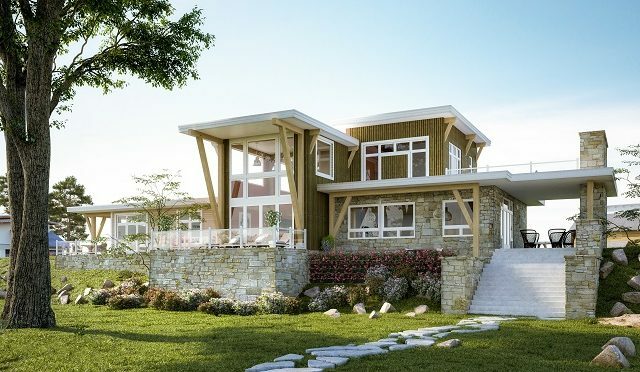 You will likely notice how the lines of the Wright appear crisper because they are accented by timbers, and the timber frame’s glow seems warmer when set within the simplicity of this modern design. Because the public and private spaces of this modern-style home are separated by the outdoor living area, the home simply begs you to enjoy your quiet moments alone as much as it beckons you to entertain guests! See the Wright’s floor plan here. Request a personalized cost to build your Wright, here. The largest design concept of The Moderns™ series is the perfectly named Newport. While there are many localities with the moniker, our Newport was named after Newport, Oregon, a delightful beachside community sheltered between the Coastal Mountains[ii], the Pacific Ocean, and picturesque Yaquina Bay. Like all The Moderns™, the Newport’s open concept floor plan is ideal for gatherings of friends and family. The Newport design concept, however, has something unique in the collection– a fully-opening glass wall. Almost every element of the Newport invites you to embrace a modern indoor/outdoor lifestyle. Large windows, extensive stonework, and timber framing adorn the exterior while numerous glass-encased, covered patios and decks surround the home. The resulting spaces allow you to enjoy all the beauty that nature has to offer, whether you are outside or in. The Newport’s great room soars with a two-story ceiling accented with beautiful timbers. This home also boasts a second level of living space and many a Riverbend client chooses this level for the master suite. It only makes sense with the second story’s open deck, loft, and large walk-in-closet. See the Newport floor plan concept here.